THE 18 HOLE COURSE DESIGNED BY LEONARD MUISE AND SEAN JACK HAS DELIVERED ON A PROMISE TO BE ONE OF THE PREMIER CHAMPIONSHIP DISC GOLF COURSES IN THE COUNTRY. THE DESIGN FEATURES WINDING FAIRWAYS THROUGH 80-YEAR-OLD CYPRESS AND PINE TREES, MASSIVE ELEVATION CHANGES, CHALLENGING PINS, TECHNICAL OB, PROFESSIONAL DISCMANIA TEE PADS AND INNOVA BASKETS. RAVE REVIEWS FROM THE WORLDS' TOP PROFESSIONALS AT THE SFO DISC GOLF PRO TOUR CHAMPIONSHIP HAVE CEMENTED THIS NEW TRACK AS ONE OF THE BEST IN the COUNTRY. THE GLENEAGLES DISC GOLF COURSE DEBUTED ON JUNE 1, 2017. DISC GOLFERS ARE WELCOME TO PLAY AFTER 11 A.M. ON WEEKENDS AND HOLIDAYS and ANY hours ON WEEKDAYS AND THE RATE IS THE SAME AS THE 9 HOLE STANDARD ROUND. DISC GOLFERS ARE REQUIRED TO ABIDE BY STANDARD GOLF AND HOUSE RULES AT ALL TIMES. Sarah Hokom aces hole 3, 374', at the SFO! GALLERIES FOR THE 2018 SFO WERE ON IMPRESSIVE FOR BOTH MEN AND WOMEN. HUGE ROARS COULD BE HEARD FROM END TO END OF THE PROPERTY AND THE AIR WAS ELECTRIC. RICKY WYSOCKI WHO WAS TIED FOR THE LEAD IN THE FINAL ROUND ENDS UP HIGH ABOVE THE 18TH PIN. 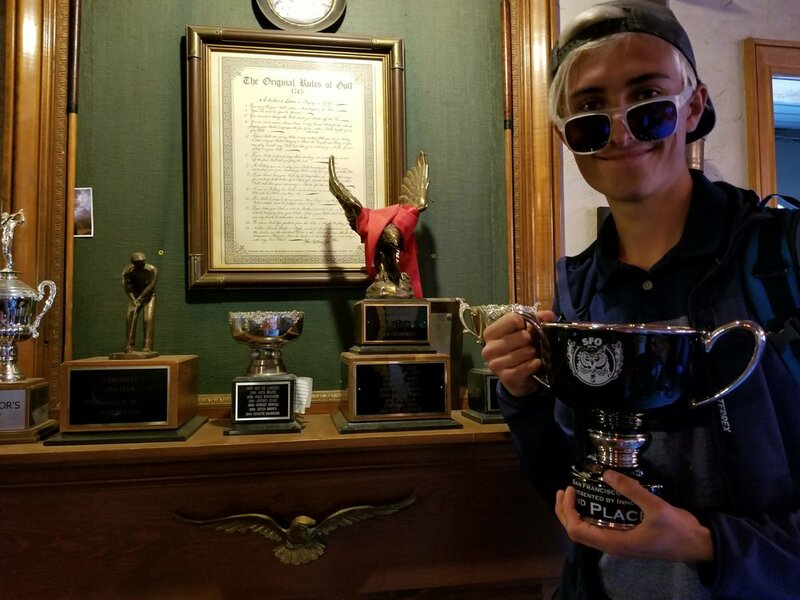 HE WOULD FINISH 3RD, LEAVE HIS CUP BEHIND WHICH IS NOW ON DISPLAY IN THE CLUBHOUSE. WE PLAN TO GIVE IT TO HIM WHEN HE RETURNS. AFTER THE FINAL ROUND OF THE 2018 SFO, A YOUNG GOLFER PRACTICES MAKING THE WINNING PUTT OF THE 18TH HOLE. AND THE MAGIC GROWS. 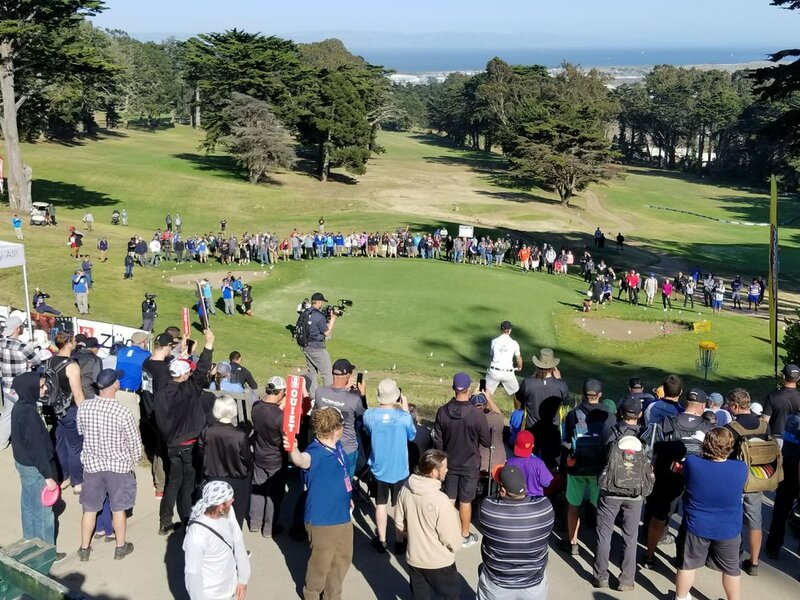 Members of San Francisco Disc Golf Club kicking off their first tournament in 2017 just after the installation of the course. Multiple baskets options make a track for a great challenge, unlike any other DC courses in the region.